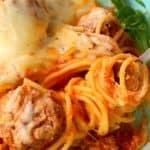 If your family loves spaghetti and meatballs, then you've gotta try this easy, slow cooker version! Loaded with Italian meatballs, ricotta and mozzarella cheeses, this easy pasta dish is a fantastic dinner option any night of the week! To the slow cooker, add the frozen meatballs, pasta sauce and tomatoes. Stir to combine. Cover and set the slow cooker on low for 6 hours. Once the slow cooking is complete, add the cooked (al-dente) spaghetti, and stir to combine the sauce, meatballs and noodles. In a medium bowl, stir together the ricotta cheese, parmesan, basil, oregano and garlic salt. Add scoops of the ricotta mixture on top of the spaghetti and spread evenly. Top with the chredded mozzarella cheese. Cover with lid and set the slow cooker for another 20-30 minutes in order for the cheeses to melt.